This is the second tutorial in the GeoGebra Essentials Series. If this is your first time to use GeoGebra, it is important that you read the Introduction to GeoGebra post. It is also important to read the GeoGebra Essentials 1. This tutorial is just a repeat of the GeoGebra Basic Construction 5, but I have put a more thorough discussion on free, semi-free and independent objects. In the tutorial below, menu commands, located in the menu bar, are in green bold text, and the submenus are denoted by the > symbol. For example, Options>Labeling>New Points Only means you have to click the Options menu, choose Labeling from the list, then New Points Only. The tool texts are colored light red. For example, New Point means, the New Point tool. In this tutorial, we use the Parallel Line tool of GeoGebra to construct a parallelogram. To construct the parallelogram, we first construct points A, B and C. Then, we use the Parallel Line tool to construct a line parallel to AB and passing through point C, then construct another line parallel to BC and passing through point A. We use the intersection of the two lines to determine the fourth vertex of our parallelogram. In this GeoGebra tutorial, we use the Perpendicular Line and Parallel Line tools to construct a rectangle. The idea is to construct segment AB, construct two lines perpendicular to it, one passing through segment A and the other through segment B. Next, we will construct point on the line passing through B, then construct a line parallel to AB passing through C. The fourth intersection will be our point D. If you want to follow this construction step-by-step, click here to open GeoGebra on your browser. 1. Open GeoGebra and select Geometry from the Perspective menu on the side bar. 2. To automatically show the labels of points and not the other objects, click the Options menu, click Labeling, then click New Points Only. 3. To construct a rectangle, select the Segment between Two Points tool and click two distinct places on the Graphics view to construct segment AB. 4. 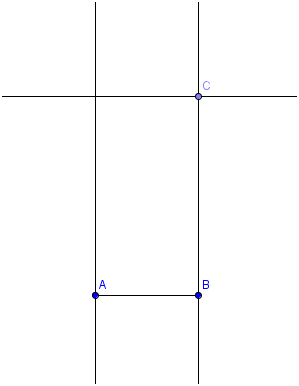 We construct two lines that are both perpendicular to AB, one passing through A and the other through B. To do this, click the Perpendicular Line tool, click point A and click the segment. 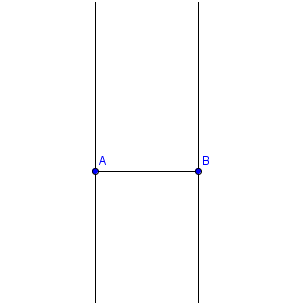 To construct another line, click point B then click the segment. After these steps, your drawing should look like the one shown in Figure 1. 5. Next, we construct a point on the line passing through point B. To do this, click the New Point tool, and then click on the line passing through B. 6. Now, to create a line parallel to AB, passing through point C, click the Parallel line tool, click on point C and then click on the segment. Your drawing should look like the one shown in Figure 2 after this step. 7. Using the intersect tool, we construct the intersection of the line passing C (parallel to AB) and the line passing through A. To do this, click the Intersect Two Objects tool and click the two lines mentioned. 8. Now, we hide the three lines. To do this, click the Show/Hide Object tool and click the three lines. Notice that the lines are highlighted. Click Move tool to hide the lines. 9. Use the Segment between Two Points tool to connect the points to construct the rectangle. 10. Drag the points of the vertices of the rectangle. What do you observe?